If he doesn't go back as far as McGovern, he's not being minimally historical. Then there are Goldwater, Adlai Stevenson and the 'headline making' Thomas Dewey... now THAT was doom. Boy that format is really dragging them down. Yeah, I wish they'd drop the game-showy format and just discuss the topic. I'll probably stick with it since I love CraigyFerg and it's only 22 minutes that I normally watch late at night but the current format doesn't work well. Yup. I think last week worked better because Michael Ian Black was on point, but they're trying to do too much with little time. It doesn't help the show is edited very poorly - the cuts are jarring. Yeah, I wish they'd drop the game-showy format and just discuss the topic. Each guest and Craig nominates two selections before the show (or three or four, with duplicates eliminated). Craig seeds the brackets in a brief pre-credits sequence (or have a shadowy Overseer a la The Banker on Deal or No Deal do it). Everyone argues the first round, commercial break, second round (more time for jokes and history and discussion here), commercial break, finals. 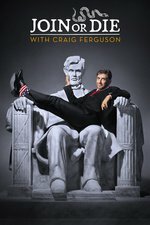 It seems to me like CraigyFerg would like to have a panel show like the ones that are all over British television, but Americans just can't comprehend the idea, and so the producers went with this quasi-game show concept because it's sorta like QI or the News Quiz, so maybe that would play to both. But its not working well as a panel show or a quiz show, and the only part of it I really like is Ferguson's monologue. Heh, CraigyFerg is still amusing throughout the show. There's a lot to improve on here, but between all shows I watch, these 20-25 minutes are regularly the ones that seem to fly by. I think the show does better when the professor is used to TV - Dan Schnur was great, kept it punchy, while Laila Lalami in the Tyrants episode kept trying to go into too much depth for the format. The comedian is usually good, and sometimes the actor is surprisingly knowledgeable about the subject. When it falls flat, _man_ it falls flat. And yeah, the gameshow format is sort of odd - 22 minutes of panel show talking about historical stuff would be great! But yeah, gimme 22 minutes of Craig's monologue and I'd be happy, frankly.